The Coton de Tuléar is a breed of small dog named for the city of Tuléar (also known as Toliara) in Madagascar. This breed is thought to have originated from a group of small white dogs who swam across the Madagascan ocean following a shipwreck. Known for its cotton-like coat, the Coton de Tuléar, typically grows to no more than 18 pounds, and are white, sometimes with gray, black, or tricolored markings. Multiple registries with differing standards describe the Coton de Tulear, but it generally has very soft hair (as opposed to fur), comparable to a cotton ball (hence its name in French, coton meaning cotton), a prominent black nose, large expressive eyes (usually covered by bangs), and somewhat short legs. 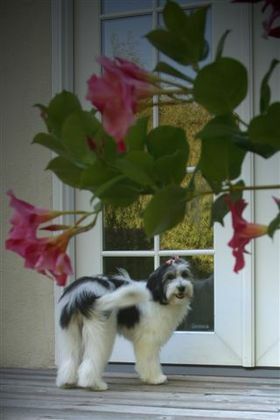 The Coton de Tulear's tail should curl over its back. The Coton de Tuléar has a medium-to-long, fluffy, cotton-like coat that is considered hair rather than fur. It is a non-shedding breed with low dander and is considered hypoallergenic. When it is a puppy, it may shed its puppy coat. Like the poodles, Maltese or the Havanese, this breed has very low allergic effects. Matted hair is common for this breed and should be removed through daily brushing and combing. Grooming the Coton de Tulear can be quite a challenge. This breed does not have the common "doggie smell" and, when properly bathed and groomed, has little to no odor. The Coton's soft hair is comparable to a cotton ball. The Coton de Tulear comes in three accepted colors: white (sometimes with tan markings; all white is preferred by show breeders); black and white; and tricolor. However, the tan and white may become all white, the blacks will often fade to grey or white, and fur will most likely change throughout puppyhood. The breed even has a fade gene that causes the colors, which are very dark when a puppy, to fade and turn white at the base of the hair as it lengthens; that is why the Champagne or Champagne Teddy Bear Coton eventually turns white when the adult hair comes in.) The Fédération Cynologique Internationale standard specifies that the Coton's coat should be white, but may also have tan or "lemon" color on their ears and body. The coat, however, must be primarily white with no black hair. The US-based Coton de Tulear Club of America allows for three different but equally favorable colorings: white, black-and-white, and tri-color, which includes "honey bear". White is described as nearly all white, sometimes with tan or champagne coloring on the ears, face or back. Black-and-white is defined as pure white with prominent black patches on the head and body (no ratio of white-to-black is specified or favored). Tri-color is described as mostly white with some brown markings and dustings of black on the body and head. A honey bear tri-color has light brown with black tips that gradually fades to an off-white or lemon color. The tri-color loses the most color of any of the color varieties, usually becoming mostly white with possibly some champagne markings and a dusting of black hairs on the ears and/or body. The Fédération Cynologique Internationale standard gives the Coton's weight as 6 to 8 kg (13 to 18 lb) for males and 3.5 to 5 kg (7.7 to 11.0 lb) for females. The Coton's height (including tolerance) is 25 to 30 cm (9.8 to 11.8 in) tall for males and 22 to 27 cm (8.7 to 10.6 in) for females. However, the Coton de Tulear Club of America standard specifies the weight as no more than 18 lb (8.2 kg), with the average being between 11 to 15 lb (5.0 to 6.8 kg). The standard height is 9 to 13 in (23 to 33 cm), except for the rare Tall Coton, which is 15 to 17 in (38 to 43 cm) tall. The long-limbed Tall Coton shows up in all three color varieties and can be born to a litter with normal-sized parents that carry the appropriate genes. The nose is black in colour in the Coton de Tulear Club of America standard. However, the Fédération Cynologique Internationale standard, which also favors a black nose, states that brown is tolerable as well. A pink or partly pink nose is not accepted in either standard. 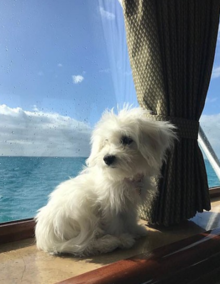 The standard advocates that the lips should preferably be tight and of the same colour as the nose, specifically black in the Coton de Tulear Club of America standard. A Coton de Tulear's teeth can be either in a scissor bite or pincer bite. Its eyes are normally round, dark in colour, and wide set. Traditionally, the expression is lively, intelligent, bright, and merry. Typically, the Coton de Tulear's ears are triangular and set high. The leather of the ear is often thin, and the neck is strong, favoured to be without a dewlap, and slightly arched. The chest is typically well developed and reaches to (FCI-Standard N° 283 / 04. 02. 2000 / GB) the elbows. A Coton de Tulear's feet are small and arched, and its back is normally strong and slightly arched. The pads of the feet are usually black. The body is of moderate length and typically has a moderate tuck-up. Traditionally, the loin is muscular and not overly long in length. The hind legs are normally strong and straight. The hind feet are similar to the front feet. Throughout history the dewclaws have been removed, however many would now oppose this arguably unnecessary and cruel procedure. The tail is traditionally low-set and tapering, carried over the back when in motion or excited, but relaxed otherwise. The Coton is a playful, affectionate, intelligent breed. Although generally quiet, it can become very vocal -- grunting, barking, and making other noises when having fun. Cotons are known to have a habit of jumping up and walking on their hind legs to please people. Most Cotons love meeting new people and are very curious in new situations. Cotons are easy to train as they are very eager to please. Cotons love to swim, run, and play. They adapt well to any kind of living environment. A common trait of the Coton de Tulear behavior is to come alive in the evening. The Coton has a coat that requires brushing and combing almost daily and bathing about once per week to maintain its beauty. Cotons love swimming; owners who have pools are recommended to let their Cotons play in the pool with supervision. Like poodles, they do not "shed", meaning they don't drop hair on furniture, carpeting, etc. They do lose hair; the texture of their coat causes the shed hair to be trapped in the coat. If not brushed and combed daily, the fur of this breed will mat up quickly and may require shaving. Cotons need a walk every day for exercise, but will appreciate a play session as often as possible, and have the endurance to go on a long hike. Cotons love to play with other dogs and they are great with kids. The Coton is in general a healthy breed. However, there are still some health issues as there are in all breeds. The most serious issues are heart problems, liver shunts, back (disc) problems, and eye problems. Luckily, these are still relatively uncommon in the breed. The small gene pool of this breed is owing to its near extinction. Due to inbreeding by disreputable breeders there is an increased incidence of disease. The smaller the gene pool, the more likely a breed is to have genetic abnormalities. The Coton de Tulear has few health issues compared to many other breeds due to being rather generic in type. It is a fairly rare breed and is just now being accepted and recognized by the AKC as of 2012. The fact that this is a breed being revived from extinction means that the Coton de Tulear is rather expensive to purchase and prices may reach $1,800.00-$3,500 per dog. The average life span of a Coton de Tulear is 14 to 19 years. The Coton de Tulear developed on the island of Madagascar and is still the island's national dog. It is believed that the Tenerife dog was brought to Madagascar and mated with a dog of the island, creating an unexpected result. The Coton's ancestors were possibly brought to Madagascar in the 16th and 17th centuries aboard pirate ships. Madagascar was a haven for pirates and pirate graveyards can still be seen there. Pirates established a base on St. Mary's Island, Madagascar and some of them took Malagasy wives. Whether the dogs were brought along to control rats on the ships, as companions for long voyages, or were confiscated from other ships as booty, no one knows. Tulear is a port now also known as Toliara. The Coton is of the Bichon dog type, linked most closely to the Bichon Tenerife and the Tenerife Terrier. There have been many stories circulating about the history of the Coton in recent years, most of them untrue. The Coton de Tulear was never feral on Madagascar. It did not hunt wild boar or alligators, as its size, strength, and demeanor can disprove easily. It was a companion dog of the Merina (the ruling tribe) in Madagascar. It has very little prey drive and is not a hunting dog. The cottony coat may be the result of a single gene mutation. This small, friendly dog caught the fancy of the Malagasy royalty and they were the only people allowed to keep Cotons. When Dr. Robert Jay Russell discovered the breed in Madagascar in 1973 and brought the first ones to America, he coined the phrase the Royal Dog of Madagascar and the name stuck. They were also imported occasionally into France by returning French colonists, but were not officially imported to Europe until the 1970s. In 1974, Madagascar released a stamp with the image of the Coton, affirming their status nation's "royal dog". The cottony coat may be the result of a single gene mutation. The Coton de Tulear was first formally recognised as a breed by the Societe Centrale Canine (the French national kennel club) in 1970 and was accepted by the Fédération Cynologique Internationale, which published the breed standard in 1972. The Coton de Tuléar is recognised internationally through the Fédération Cynologique Internationale and by major kennel clubs (The Kennel Club (UK) in the Toy Group, and the United Kennel Club (US) in the Companion Group), using standards based upon the Fédération Cynologique Internationale standard. The breed is not recognised by the New Zealand Kennel Club or the Australian Kennel Union. It also may be recognised in the English-speaking world by any of the very large number of minor registries, clubs, and internet-based dog registry businesses. In the United States, another standard for the Coton de Tulear was developed based upon the breed in Madagascar in 1974 by a biologist, Dr. Robert Jay Russell. Russell established the Coton de Tulear Club of America in 1976 and was opposed to American Kennel Club recognition. The Coton de Tulear entered the American Kennel Club Foundation Stock Service (their first step in breed recognition) in 1996, and became a fully recognized breed on July 1st, 2014. The American Kennel Club Parent Club for the breed is the United States of America Coton de Tulear Club. ^ Lacoste, Kristine (2017-05-27). "5 Things to Know About the Coton de Tulear". Petful. Retrieved 2019-03-11. ^ a b c "Standard No. 283 of November 25, 1999, translated February 4, 2000" (PDF). Fédération Cynologique Internationale. Retrieved 3 May 2015. ^ Dogs that do not shed at Go Pets America. Retrieved September 7, 2008. ^ "CTCA standard". CTCA. Retrieved 3 May 2015. ^ "The Official Coton de Tulear Book". The Coton de Tulear Club of America. ^ Dublin Society for Prevention of Cruelty to Animals. "Tail Docking in Dogs and other Acts of Mutilation in Dogs & Cats" (PDF). Dublin Society for Prevention of Cruelty to Animals. Dublin Society for Prevention of Cruelty to Animals. Retrieved 9 February 2017. ^ "About the Coton". USACTC, Inc. Retrieved 20 January 2012. ^ "Coton de Tulear History - American Coton Club". www.americancotonclub.com. ^ "Accueil - Société Centrale Canine". www.scc.asso.fr. ^ "The AKC Family Grows to 180 Breeds" American Kennel Club. ^ "The United States of America Coton de Tulear Club". www.usactc.org. Wikimedia Commons has media related to Coton de Tulear. This page was last edited on 11 March 2019, at 09:10 (UTC).